I will admit that my knowledge about the Pre-Raphaelite Brotherhood is slim: Medieval themes. Red hair. You can go into the Walker Art Gallery for free at any time and see a few lovely examples of these, or to Lady Lever in Port Sunlight and see even more. So I have wanted to go down and see this exhibition at the Walker for a couple of months and was looking forward to an exploration of what the title promised. Beauty and Rebellion. For me the ‘Rebellion’ part of that is the most fascinating, as I like art which pushes boundaries. The painting of the Pre-Rapahelite Brotherhood (PRB from here on in) are certainly very beautiful, and even if you go to this show without any knowledge of the PRB’s history and context, there’s a lot to admire. One of the things about their painting is how sumptuous they are. 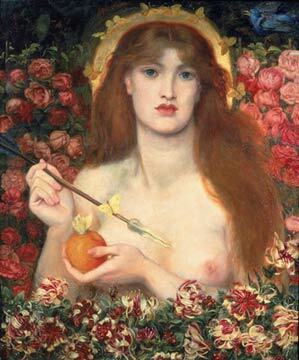 Take Rossetti’s Venus Verticordia – the way her hair is painted is so real, so soft, I want to run my fingers through it. I want to eat the apple she’s holding, and smell the roses. I can’t get too bored with the repeated images of red-haired women, as each one holds so much detail. The technical skill on show here is strong throughout, and is at its best when mixed with the PRB’s taste for strong colour. 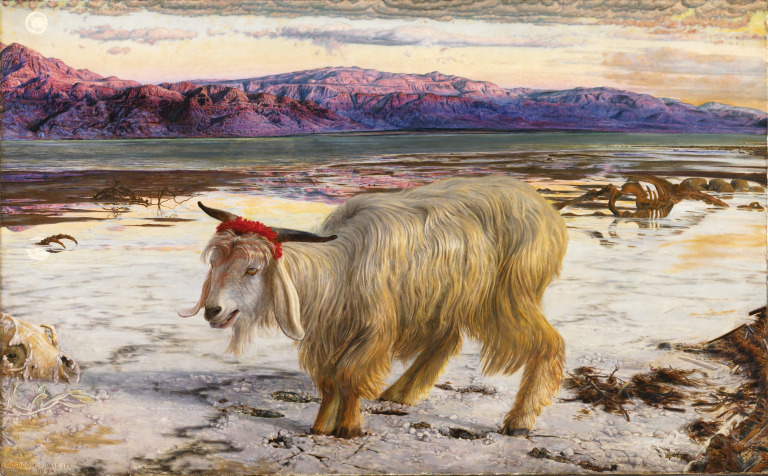 The first painting that captures your eye when you go in is Holman Hunt’s The Scapegoat. Big, unsettlingly bright and painted with such detail, the effect is quite unsettling. The exhibition looks at a part of the story of the PRB which I didn’t know. Usually portrayed as the outcasts of the art circle of the time, it turns out that the group were rather popular in Liverpool. They had the support of the Liverpool Academy and several wealthy patrons in the city, and the exhibition focuses on the patron’s support and the influence of the PRB locally. It’s a story I would say most people didn’t know and is interesting to explore. My problem was, though, that it wasn’t what was advertised. I went expecting an exploration of ‘Rebellion’ instead, and it didn’t look at that side of their work as much as I wanted it to. I went with a friend to see this show and she said the same thing. This is partly a problem of our modern eyes and tastes – when it comes to the section which focuses on the PRB influence on the Liverpool School, to me one landscape painting looks much like another, which has a certain irony as the Brotherhood were all about wanting you to notice their paintings. I think if we had gone with the idea of “Pre-Raphaelites in Liverpool” in mind, I would have left with a more favourable view. But I didn’t, so I had mixed feelings. If you like rich, aesthetic paintings with layers of meaning and seductiveness, this will be a pleasing way to spend an hour. It just doesn’t quite do what it says on the tin. This entry was posted in Exhibitions, Home, Past exhibitions and tagged art, Beauty, Liverpool, Pre-Raphaelite, review. Bookmark the permalink.